Fur trader William McGillivray (1764?-1825) was born in Scotland and brought to Montreal in 1784 by his uncle Simon McTavish of McTavish, Frobisher and Company. McGillivray was made a partner in the North West Company in 1790, and on McTavish’s death in 1804 McGillivray became the company’s chief director. Fort William, the company’s headquarters on Lake Superior, was named in his honor in 1807. McGillivray commanded a company of voyageurs in the War of 1812, assisting Issac Brock at the capture of Detroit. In recognition of these services he was appointed to the legislative council of Lower Canada in 1814. Between 1814 and 1816 he directed the North West Company’s opposition to the Red River Settlement and was captured when Lord Selkirk seized Fort William in 1816 as a reprisal for the destruction of the settlement. McGillivray emerged unscathed from the protracted legal proceedings that followed. 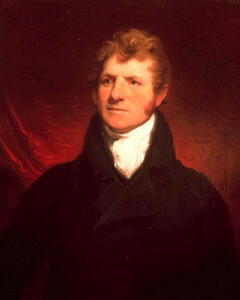 He was associated with his brother Simon and with Edward Ellice in 1821 during the negotiations that ended in union between the Hudson’s Bay and North West companies and was made a member of the joint board formed to manage the fur trade. He died in London, England.